Established in 2010, the Bochemistry Unit of the LAMPEA is dedicated to research activities in Physical Anthropology and Bioarchaeology. The unit facilitates preparation of archaeological materials, such as human, animal and plant remains, for stable isotope analysis (C, N, S, O) to study paleodiet, palaeoenvironment and human behavior through time and space. Research activities supported by the unit include archaeological case studies across entire France (e.g. Southern France, Auvergne, Pacific Islands, Peru, Czech Republic, Balkans, Italy, Switzerland, Morocco, Japan, Siberia). These diverse studies, completed or in progress, have revealed several important insights. For example : (1) Rapid dietary change in Pacific Islands linked to colonization (Valentin, Herrscher et al., 2014) ; (2) Impact of breastfeeding and weaning strategies on health and dietary patterns in the Prehistoric Danube Gorges (Jovanovic et al., 2015 ;) ; (3) Geographical variation in food practices during the Neolithic in Western Europe (Goude and Fontugne 2016). A recent addition to the scope of work supported by the Biochemistry Unit is research on carbon and nitrogen stable isotopes using the technique of sequential micro-sampling of human tooth dentine from middle Holocene hunter–gatherers in the Baikal region. The goal of this work is to establish high-resolution dietary history of early human life from birth to c. 15–20 years of age (Scharlotta et al. in revision). Valentin F, Herrscher E, Bedford S, Spriggs M, and Buckley HR. 2014. Evidence for social and cultural change in central Vanuatu between 3000 and 2000 BP : comparing funerary and dietary patterns of the first and later generations at Teouma, Efate. The Journal of Island and Coastal Archaeology 9:381-399. Jovanović J, de Becdelièvre C, Goude G, Le Roy M, Herrscher E, and Stefanović S. 2015. Diet and health status of children at the Mesolithic Neolithic transition in the Danube Gorges / Ј. Јовановић, К. де Бекделиевр, Г. Гуд, М. Л Руа, Е. Ершер, С. Стефановић. Исхрана и здравствени статус деце у мезолиту и неолиту ђердапа. Arhaika 3:42-65. Goude G, Fontugne M. 2016. Carbon and nitrogen isotopic variability in bone collagen during the Neolithic period : Influence of environmental factors and diet. Journal of Archaeological Science 70:117-131. Scharlotta I., Goude G., Herrscher E., V.I. Bazaliiskii, Weber A.W. n.d. “Mind the Gap” – Assessing methods for aligning age determination and growth rate in multi-molar sequences of dietary isotopic data. American Journal of Physical Anthropology. Submitted. 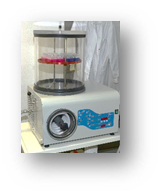 The unit allows sample preparation, such as collagen extraction, micro-sampling or laser-ablation sample pretreatment, for bio- and geochemical tests. 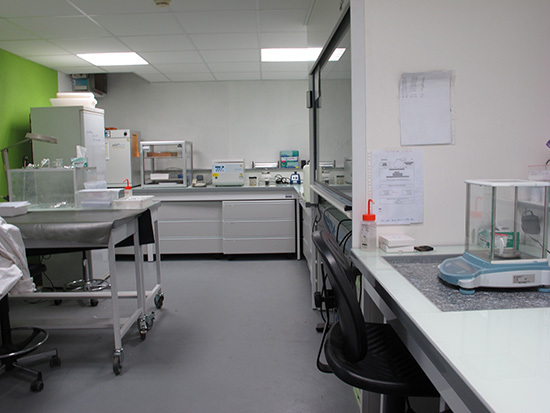 The available laboratory equipment includes fume hood for chemical treatment, ultrasonic bath, sandblaster, vibratory micro mill, centrifuges, heating block, freeze dryer, –80°C freezer, laboratory refrigerator, drying cabinets, sterilizer, safety cupboard, washer-disinfector, analytical balance and microbalance, water filtration system. The unit also supports preparation of thin sections of many materials (precision micro-saw), preparation of casts, coating and polishing. The Biochemistry Unit has been supported through grants from Aix-Marseille University, CNRS INEE, A*MIDEX, ANR, Institut Danone France/Fondation pour la Recherche Médicale.